The Outdoor Ministry Committee of The Presbytery of South Alabama is proud to offer the next installment of our exciting new camping ministry! 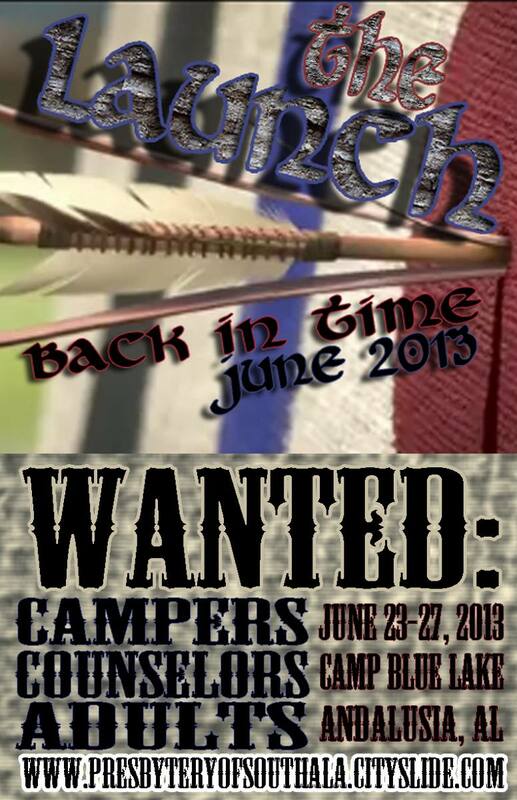 It's called "The Launch: Back in Time" and it will be held from June 23 to June 27 at Blue Lake Campgrounds in Andalusia, AL. Our camp last year was a huge success, and we know that this year is going to be even bigger and better! We'll be going back in time to spend the week in a medieval kingdom! We'll learn what it means to represent Christ and show forth the fruit of the Spirit. We'll also discover what it takes to participate in the coming Kingdom of God! Along the way we'll stand up to the numerous villians that represent greed, envy, rage and selfish ambition. Are you brave enough to stand up for the Kingdom? The week will include daily Bible studies, large and small group games, competitions, campfires, worship, skits, crafts, great food, swimming, canoeing, a 16-foot inflatable slide, archery and much, much more! Our 5-day camp will have a complete staff of High School and College counselors, a Program Team of Adults and Pastors, as well as a Full Camp Staff, Licenced Medical Staff, and Trained Lifeguards. All Forms with an * are required!